Online casino web browsers - What is the best for keno games? The frustration when you can’t get a game to load at an online casino is infuriating. Mac users know what i’m talking about with the standard Safari browser prone to struggling with flash-based games. This doesn’t mean you should give up, rather use one of the browsers which supports flash, or HTML5, the latest mobile protocol. Keno, a simple pick and match number game, is readily accessible via many different browsers with Google Chrome, Firefox and Internet Explorer the pick the batch for online gaming. Also known as no-download play. Instant play and browser-based, browser-play keno is the simplest and fastest way to play keno online. All you need to do is sign up to one of our recommended online casinos like www.Guts.com, which offers a 100% deposit bonus up to $400 on sign up, and then search for “keno” to start playing. Browser-play refers to a game simply loading in your browser without the need of additional software or casino suites to play, so once you sign up, make a deposit and find your game of keno, you can start playing without having to wait for additional software to load and install. Browser-play keno is not only the fastest and easiest way to play keno: it’s also the safest. As you are downloading and playing the game from within your browser, there’s no threat of malicious viruses or other nasty things being installed on your computer. Most of the best web browsers alert you if a site may potentially be dangerous, and thankfully all of our recommended casino sites employ the gold-standard in online security, meaning they work fast and securely in all of the more popular web browsers. You can play keno on essentially every known major browser, and on all devices. The more popular browsers in the likes of Chrome, Firefox, Edge, Explorer and Safari will all load and play keno without any issues. However, each browser offers different features, and has different levels of reliability, speed and security. Let’s take a look at each browser to see which one is right for you. Chrome: Chrome is the internet’s most popular web browser, and for good reason. It offers the best online security of all the available browsers, and while the likes of Firefox and Edge are similarly stringent on their security measures, Chrome stands out from the pack. The are two downsides, however: it’s made by Google, so unless you browse in Incognito mode, there’s no guarantee that everything you view and access isn’t stored somewhere, and the user experience is trumped by the likes of Firefox, which offers a cleaner, more accessible browsing experience. Still, Chrome is arguably the best of what is already a very strong list of safe and secure browsers, which is good seeing as though you’re depositing funds from your private financial account. Firefox: Firefox is similar to Chrome, but doesn’t offer as much in the way of customisation and add-ons. However, it’s still serviceable in those areas, and for playing keno online it’s still a very good browser to use. It’s certainly among the fastest of the top browsers out there, which is important when loading games, depositing and withdrawing, and playing live dealer games at online casinos. Microsoft Edge: Formerly known as Explorer, Microsoft Edge is a significant improvement over the infamously slow and laggy browsing experience. Still, someone with a keen eye and the technical know-how may spot some slight differences in the functionality and overall speed of Edge next to the likes of Firefox and Chrome. Edge is, at its core, a “default” browser, and so it’s fairly limited in comparison to other browsers. It still runs relatively consistently, although this of course depends on the device you’re using. Explorer is still used more than Edge, despite being made officially obsolete by Microsoft. Safari: Safari is a fast, no-frills browser that can get the job done for playing keno and other casino games online, but the jury’s out on whether it offers as secure a browsing experience as Chrome or Firefox. It’s the default browser on Apple devices, but is normally replaced by Chrome or Firefox. It might get the job done, but its performance can often make for a not-so-smooth keno experience. There’s nothing stopping you from using one of Safari or Edge, and both have solid and workable functionality to play keno online. But there’s no harm in downloading one of Firefox and Chrome, both of which offer a better, faster and safer browsing experience. How about mobile keno in Web browsers? 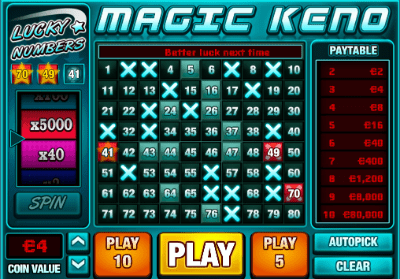 Playing keno on your tablet or smartphone device is incredibly easy. Playing on-the-go is as simple as navigating to your mobile browser, whether it’s Firefox, Chrome or Safari, signing into your account at the casino of your choice, and loading up the keno game. All of our recommended casinos work on iPhone and iPad, and Android smartphones and tablets. If you wish to use Chrome on an Apple device, you’ll need to download it from the App Store. Newer Android models have Chrome installed already. Firefox is a neutral third-party browser, and will need to be downloaded on both Apple and Android devices. Playing keno on a mobile or tablet device is really no different to playing on your desktop browser, as it loads up and functions almost identically. The only main differences being that the screen is obviously smaller, and you’ll use touch-screen features to navigate and place bets. All casinos recognise the device you’re using, so there’s nothing you have to do in order to play the game on mobile: just load up the browser, navigate to your favourite online casino and keno game, and start playing. The casino will do the rest for you! Is it safe to play keno in browsers? All of the casinos that we recommend on KenoSites.com.au use the highest tier of security, the gold standard minimum 128 bit SSL (Secure Socket Layer) digital encryption. The best way to make sure if a site uses this form of security is to visit the site using “https://” before the URL. If the website won’t load, it means it’s not using SSL encryption. This method of security is used by banks to ensure that your personal and financial information is 100% safe and secure. Chrome and Firefox are also very good at finding malicious websites. You’ll generally be greeted by a big red warning page if the website you’re trying to visit is dangerous. Thankfully, all of our recommended casinos pass the Chrome/Firefox security test, so you can rest assured that behind SSL encryption and the gold standard of browser security, it’s safe to play keno in browsers. Keno is one of the most popular casino games among Australian players. It’s a simple pick-and-match number game, with balls typically numbered 1 through 80. The aim is to match as many of the 20 numbers called with your own selection of numbers, with the potential for huge, life-changing wins. Keno is easy to play online at all of our recommended online casinos, which all host keno games. All can be played within your browser, and in this article we’ll guide you through the best internet browsers to use when playing keno online.